Build Your Favorite Student an A+ Gift Basket! If a special someone in your life will be continuing their education this fall, the time is right to put together a thoughtful gift basket to celebrate! Whether they are close to home or farther away than you’d like to think about, a surprise basket packed with tempting treats and essentials will help make sure every day – no matter how stressful – has some sweetness. Ludens Cough Drops: Going to class with a cold is bad enough, but if you’re spending the whole time trying to quiet a cough without a cough drop, chances are good you aren’t really absorbing the lesson. Luden’s cough drops are a favorite for their taste and effectiveness, and it’s easy to keep the slim box in your backpack at all times. Sugarless Gum: You know that feeling of reaching in your purse or pocket for your keys, wallet or cell phone, and realizing you left them at home? That’s how I feel when I’ve had an especially flavorful lunch and pull out an empty pack of gum! A college student’s day is often packed with activities, and making time to go back to their dorm room or apartment to freshen up isn’t always an option. Including some sugarless gum in their gift basket helps them make a good impression during presentations, and simply while talking with fellow students and teachers. I find that it helps me concentrate as well, an important aspect of studying! Mints: While chewing gum isn’t always an option, a mint almost always works! Blair Candy offers many popular options, including: Certs, BreathSavers, Ice Breakers, Ice Breakers Duo, Life Savers, Mentos and more. You’ll also find pocket-size Tums in 12-roll boxes, which are especially great after a risky cafeteria adventure, or eating cold pizza that was ‘stored’ on the dorm room floor! Now that we’ve covered the essentials, don’t forget the really fun stuff. Candy bars, gummy candy, Tootsie Rolls and lollipops make late night study sessions a little bit easier and a lot bit tastier! Love the idea of the gift, but don’t have the time to build a basket of your own? Check out our Can of College Fun Treats & Sweets. We’ve filled this awesome gift with tons of terrific choices, packed fresh by hand here at Blair Candy! You’ll find chips, pretzels, microwave popcorn, Pop-Tarts and more. A Sweet Spin on a Classic Treat for Teachers! Green Apple Gummy Bears – These Albanese gummy bears are jam-packed with green apple flavor! Soft, sweet and downright adorable, we think most teachers would choose these friendly looking fellas as teacher’s pet! Sour Patch Apples – Shaped like the tiniest apples you’ve ever seen, these softly sour yummy gummies are one of my personal favorite candies. Buy a big bag and you’ll have plenty for the teacher and yourself! 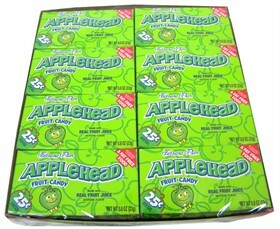 Green Apple Airheads – I’ve never met an Airheads flavor I don’t like, but green apple are among my favorites. The only thing brighter than their shiny wrapper and fresh flavor is your super student! Want to include even more apple goodness in your teacher gifts? We’ve also got Green Apple Tootsie Frooties, Appleheads candy, Apple Laffy Taffy – even Green Apple Tic Tacs!